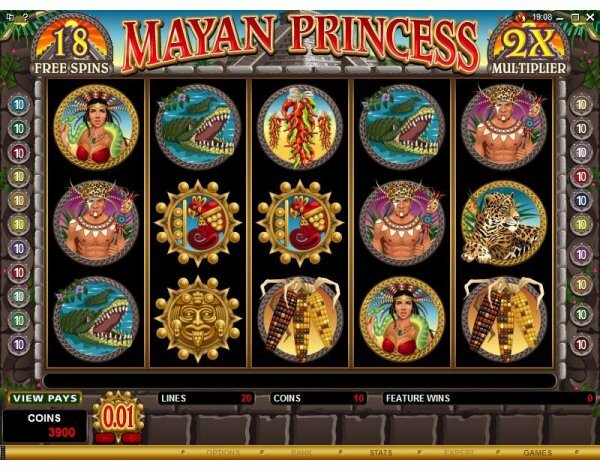 Overview: April 2009: The mysterious Mayans, an ancient and fierce South American culture that disappeared centuries ago, are brought back to life in a stunning new video slot -- MAYAN PRINCESS. The photo-realistic graphics and authentic sound effects on this 5 reel, 20 pay-line and multi-featured game conjure up an exotic jungle theme replete with brave befeathered warriors, seductive priestesses, wild animals and fierce golden masks from a bygone age where ceremonial sacrifices was the norm, yet wonderful towering pyramid structures were built and advanced astronomy was practiced. 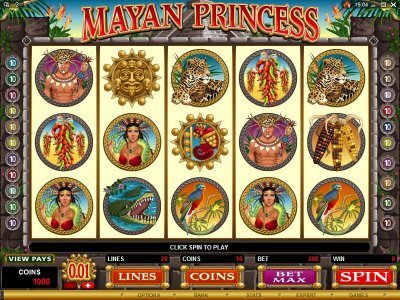 It's all there in Mayan Princess, in vibrant color and 21st century slot technology. 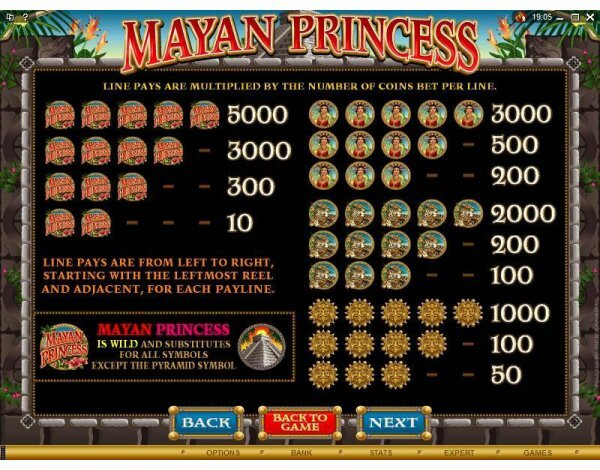 The Mayan Princess logo substitutes for all the symbols except the Scatter Pyramid in putting together winning combinations. 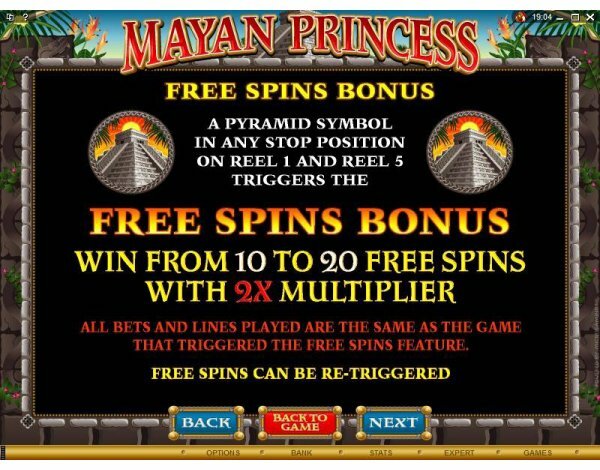 The Mayan Pyramid is another desirable symbol - when it appears in any stop position on Reel 1 or Reel 5, it triggers up to 20 Free Spins, where winnings are doubled. 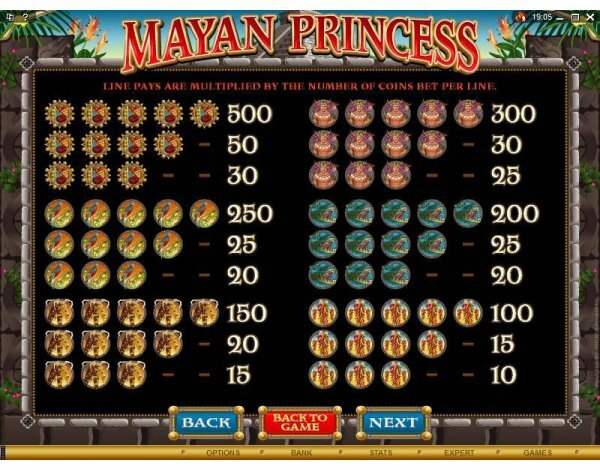 Similar Slots: If you like Mayan Princess, you might like these other 5-reel slot machines: Celtic Crown, Deck the Halls, Dog Father, Fortune Finder, Sterling Silver, The High Life.